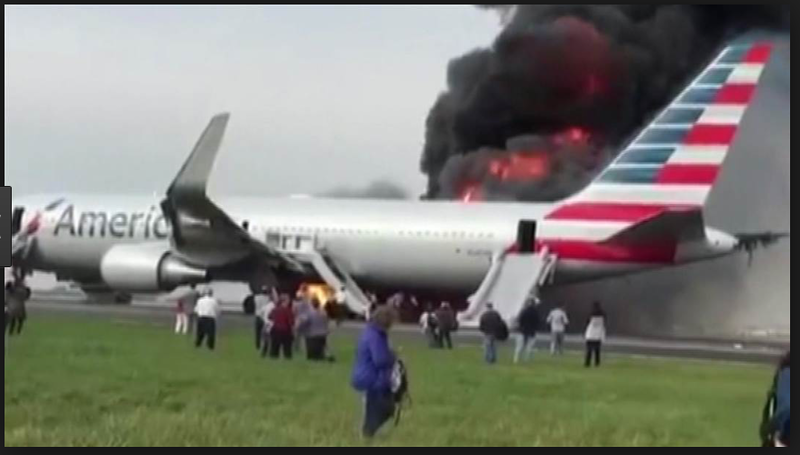 On October 28, 2016, American Airlines Flight 383 (Boeing 767-300ER) suffered an engine failure that led to a severe fire. The NTSB (National Transportation and Safety Board) issued an investigative update on November 2016 about the uncontained failure on American Airlines Flight 383. 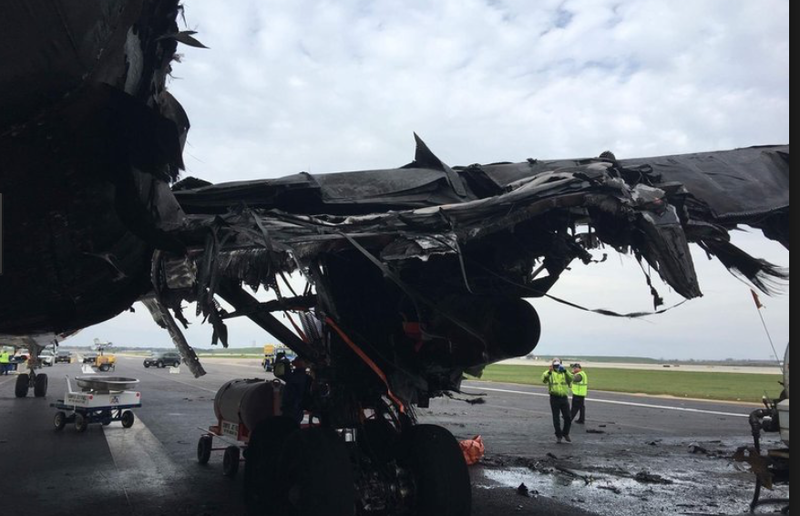 The uncontained failure of a GE CF6-80C2B6 engine occurred on a Boeing 767-300 (N345AN) during the take-off roll at Chicago O’Hare International Airport. An emergency evacuation of the 161 passengers and 9 crew members onboard was conducted. The accident flight started its take-off roll on runway 28R at the intersection with taxiway N5. The airplane experienced an uncontained failure of the right engine about 6,550 feet from runway 28R threshold and came to a full stop at about 9,225 feet from runway 28R threshold. Preliminary FDR data show that the right engine failure occurred at airspeed of about 128 knots with the engine operating at take-off power. Approximately after two seconds of engine failure, the left and right engine throttle lever angles decreased rapidly at about 134 knots. Coincident with the throttle movement, brake pressure rose in consistent with maximum autobrake application and the auto speed brakes were extended. The aircraft rapidly decelerated and came to a stop about 25 seconds after the throttle reduction. As a result of the uncontained failure, a fuel leak resulted in a pool fire under the right wing. Airport rescue and Fire Fighting Personnel began applying foam within 2 minutes 51 seconds of being notified of the emergency. The right engine stage 2 high pressure turbine disk fractured into 4 pieces (at least). One piece went through the inboard section of the right wing, over the fuselage and into a UPS warehouse facility. The U.S. National Transportation Safety Board released more than 500 pages of investigation reports on July 7, 2017. The outline of the report is below. Leaking fuel triggered a massive fireball on the right of the plane as passengers evacuated out the other side. Out of 170 people, one person suffered a serious injury and 19 had minor injuries. One attendant reported having an altercation with a passenger who refused to obey her instruction to leave luggage behind. “He refused to drop it and proceeded forward with the bag over his head,” she said. All three of the exit doors were opened within 40 seconds of the plane stopping, though the engine’s exhaust was buffeting the two inflatable exit slides at the middle and rear of the aircraft. A rotating disk within the GE-CF6-80 engine had an “internal inclusion”, meaning foreign debris became embedded within the nickel and chromium based alloy, designed to withstand the heat and high stresses of a jet engine. According to GE, the engine that failed was built in 1997.